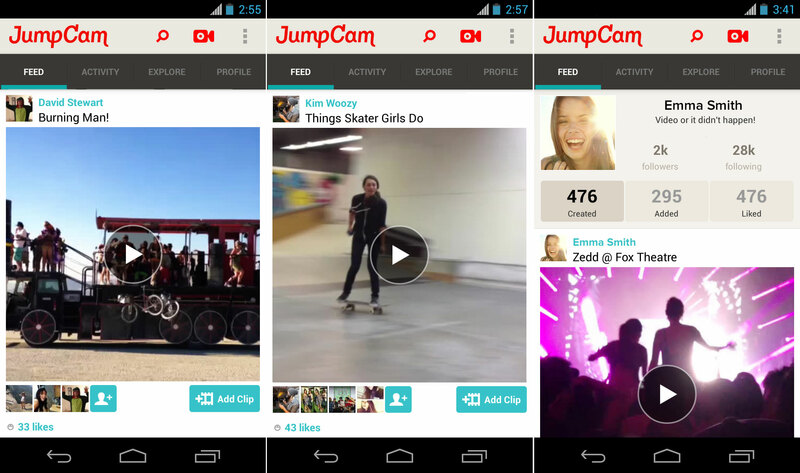 Video collaboration service JumpCam is expanding to the Android platform. Starting today, users can download the app from the Google Play store to compose videos and solicit clips from their friends to compile a well-rounded collection of any specific event. It comes more than a month after JumpCam’s iOS app launch. Company CEO David Stewart says the average video on JumpCam contains three shared clips, and is between 25 and 40 seconds in length. As a refresher, JumpCam is an app that is akin to Everlapse for video. One person starts a movie and can add up to 30 clips, each one lasting up to 10 seconds. Users can ask friends, colleagues, or the general public to contribute their own clips. JumpCam works with all devices running Android 4.0 and above and is compatible with 7-inch tablets.